Very cool clasp. 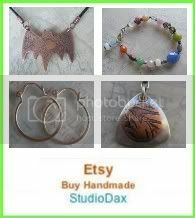 I’m enjoying your blog and your jewelry designs. I have recently started attempting making wire jewelry. I came upon a simple bracelet design that uses closed wire rings alternating with glass rings. 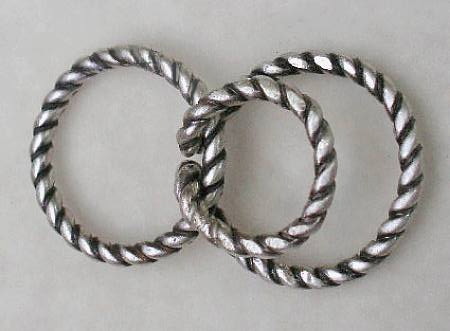 The wire rings are closed using two wrapped loops. HOW DO I MAKE THESE WIRE RINGS without losing the shape of the ring. I’m a beginner and have no clue. Any tips would be much appreciated. Lisa, thanks much! I cannot tell what kind of closed wire rings yo are refering to… but you can harden wire rings by hammering them or tumbling them, which will help them keep their shape. I suggest stopping by a local bead store and asking them your questions – local bead shops are very helpful! This is a great clasp. Thanks for sharing how you make it. I want to try one this way. love this. just subscribed today. I hope you learn a lot from you! I work in exactly the same way 🙂 I always have wire and pieces of metal next to me plus a small box of tools, pliers, hammers, files, rulers, bench block, mandrels etc: (my ‘inside’ tool box). I’ve come up with some very good designs/ideas just by bending, shaping and forming pieces of metal. Great minds think alike – ha ha!! !